1- Peppered Bacon Salt (2oz): All natural bacon flavored seasoning salt. Perfect for the grill, smoker, eggs, veggies, salad & potatoes! 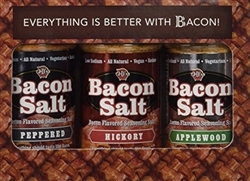 1- Applewood Bacon Salt (2.5oz): All natural bacon flavored seasoning salt with the essence of smoked applewood. Perfect for the grill or smoker. 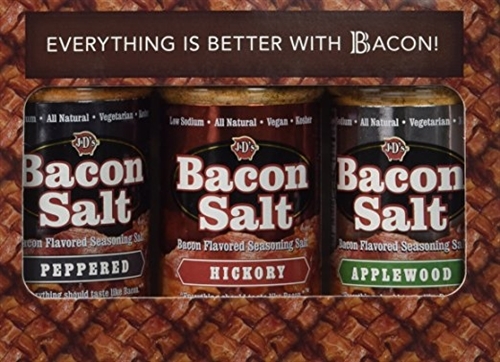 1- Hickory Bacon Salt (2oz): All natural bacon flavored seasoning salt with the essence of smoked hickory. Perfect for the grill or smoker.